Recent property valuations by Boxwood's clients hint towards a possible slowing in small balance loan originations at year end. 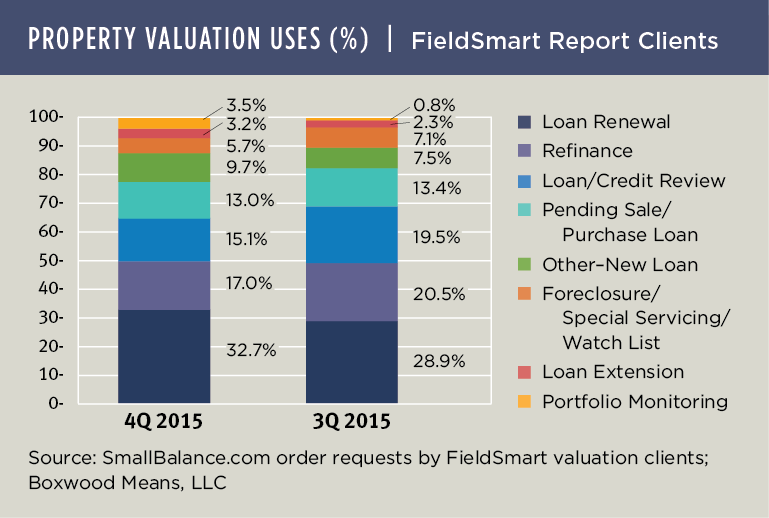 Originations accounted for 30% of the valuation uses for FieldSmart reports ordered by SmallBalance.com clients during fourth quarter, down nearly four percentage points from third quarter. Loan renewals rose with a plurality of 33% of all valuation uses. Though representing a small overall percentage, portfolio monitoring also increased as concerns over market risk and values heightened. FieldSmart commercial evaluations are tapped by 100+ lenders on SmallBalance.com as a cost-effective alternative to appraisals on small balance loan collateral.